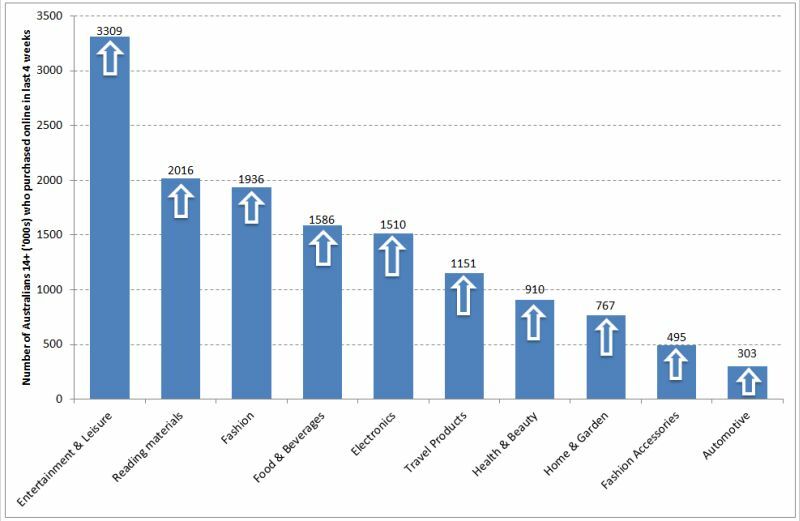 To explore the individual experience of the online shopping juggernaut, I will summarise steps undertaken to purchase two products from one of the most popular online shopping categories – fashion. My choice of online retailer is the luxury American fashion designer, Oscar de la Renta. Born Óscar Arístides Renta Fiallo in July 1932, De la Renta’s grew to become of one the fashion world’s most recognised couturiers specialising in timeless, feminine styles. His designs, some of which have been worn by distinguished celebrities, are available in his brick-and-mortar stores and online. 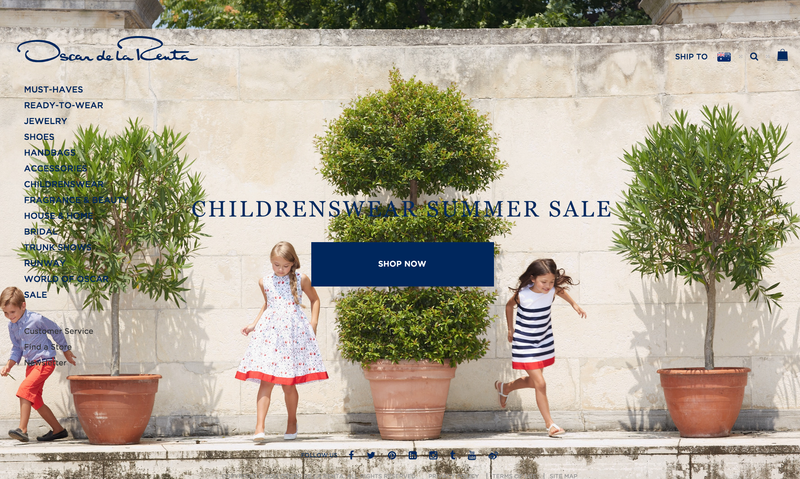 The URL of the official Oscar de la Renta e-commerce website iswww.oscardelarenta.com. 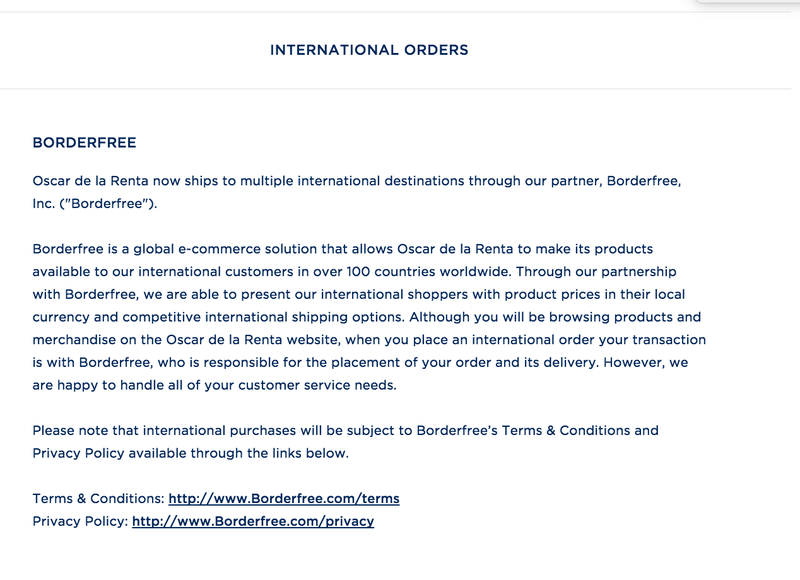 The website offers international shipping to over 100 countries through its courier partner, Borderfree. 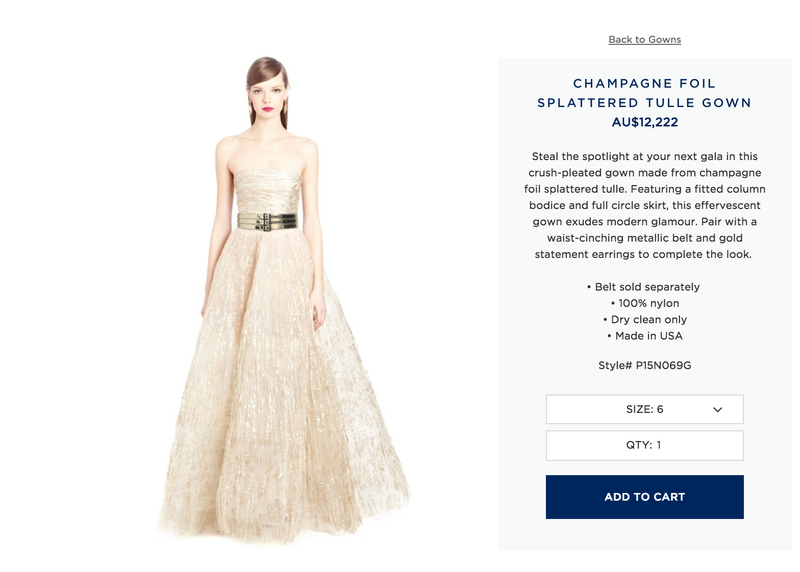 The product catalogue of the Oscar de la Renta online boutique is clearly categorised from the moment the internet user accesses the homepage. While there is not one ‘Shop’ or ‘Products’ pages, the website displays 14 categories, of which 10 categories contain products which can be bought by the user. These 10 categories are: Must-Haves, Ready-To-Wear, Jewelry, Shoes, Handbags, Accessories, Childrenswear, Fragrance & Beauty, House & Home, and Sale. Sub-categories exist within each of these product categories. 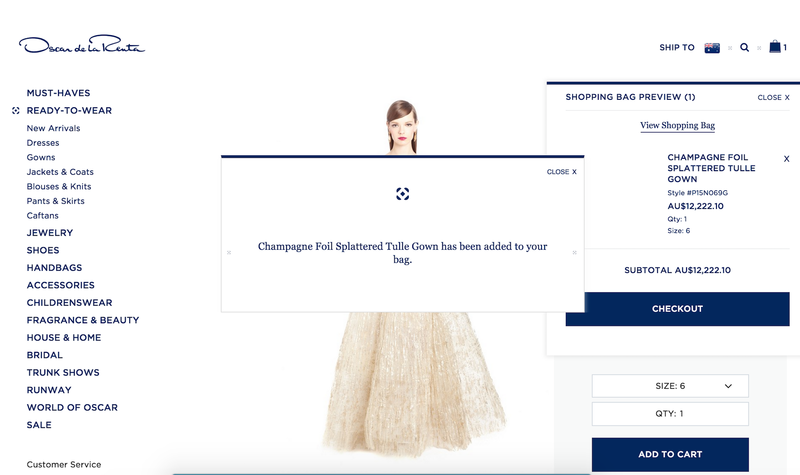 For example, by clicking on the Ready-To-Wear category, a drop-down menu appears with the following sub-categories: New Arrivals, Dresses, Gowns, Jackets & Coats, Blouses & Knits, Pants & Skirts, and Caftans. The distinct categorisation of products based on the product’s main function assists the customer in making shopping decisions more quickly than if they were to access a catalogue in which there is no categorisation. To add the product to a cart, the customer must specify a size (if any) and the product must be in stock. 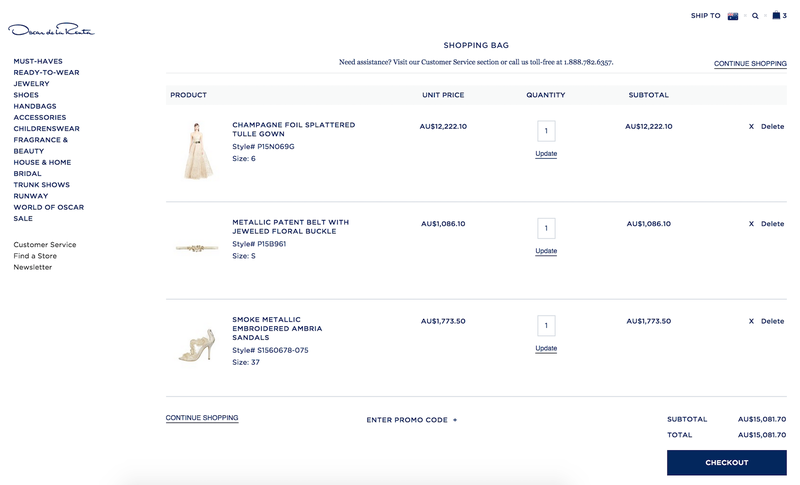 After clicking on ‘Add to Cart’, the product can be viewed in the shopping cart by either clicking on the ‘View Shopping Bag’ link that appears after adding a product to the cart or by clicking on the shopping cart icon. Ordering and paying for the items added to the cart are two straightforward processes. 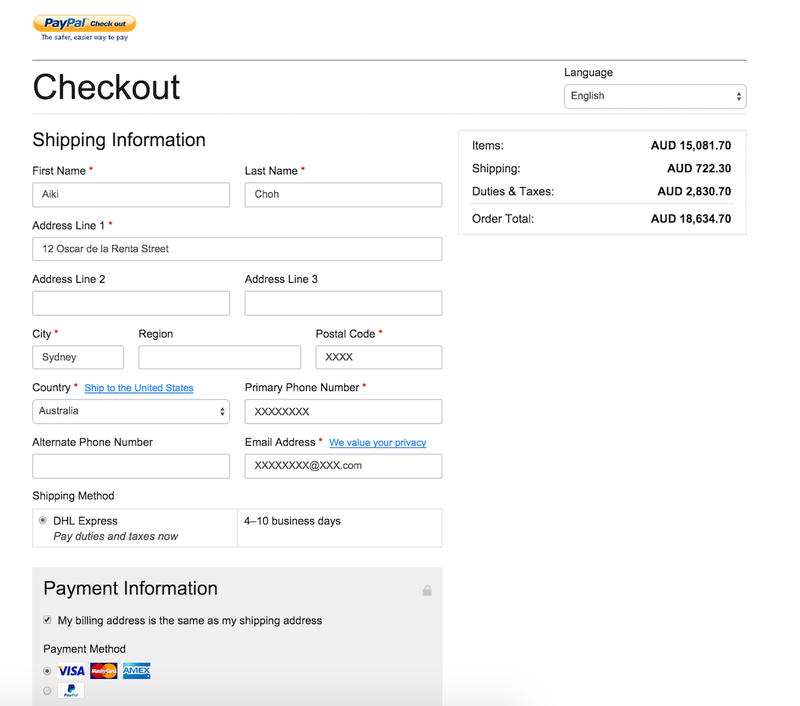 Clicking on ‘Checkout’ leads to the payment page in which customers fill out contact, delivery, and payment details. After filling out the form, the customer can proceed to submit their details. From then on, the order will be processed and the order will be delivered to the recipient’s address. 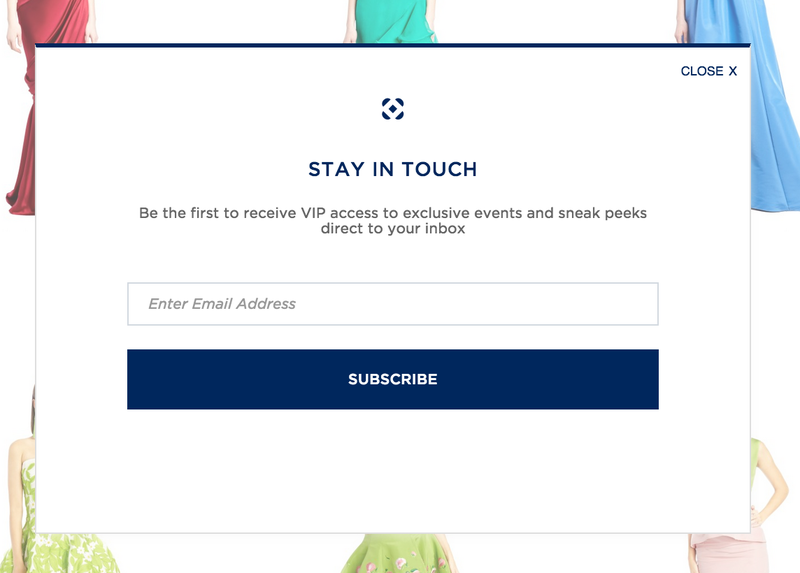 Registration for a customer account with a business is recommended for customers wishing to receive online newsletters, to keep track of their order history with the online boutique, and to facilitate the ordering process. 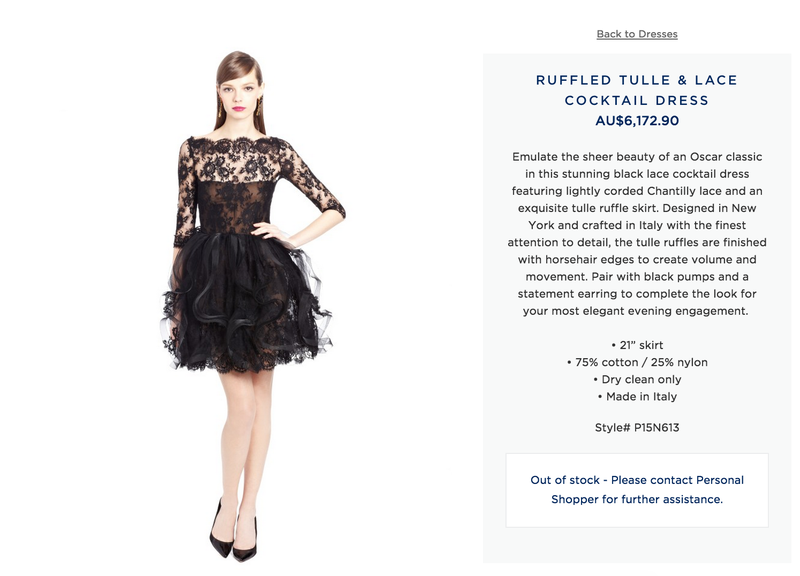 However, there is no such option for Oscar de la Renta customers, even though the FAQ page suggests that customers are given the option to ‘Sign in’. Customers may register for regular newsletters to keep abreast of news and promotions. Online marketing is facilitated by the use of social media services and email marketing in the form of newsletters. Customers can ‘like’ or ‘follow’ Oscar de la Renta’s Facebook, Twitter, Pinterest, LinkedIn, Instagram, Tumblr, Youtube, or Weibo pages. The website emphasises minimalism and the use of large images over a white background. The navy blue font over the white background is clear to read. On its product pages, items are aligned clearly so as to promote visibility. The company has been verified as a secure and certified seller by McAfee SECURE and TRUSTe.